If you are a bookworm, you must have been experienced the changes from reading physical books to ebooks on iPhone, iPad etc. However, there is a problem that iBooks is not a stock app but still requires users to use iTunes if they wanna import books or transfer epub to iPhone. This can be very annoying at times especially when you haven't installed iTunes to your computer. And with the advent of iBooks on Mac OS X 10.9, transferring epub to iTunes is no longer working after you drag-n-drop the epub documents to iTunes, connect your iPhone, and sync the non-iBook file via file sharing system in iTunes. Thankfully there are ways you can use to import epub to iBooks on your iPhone or iPad without using iTunes. BTW, this tutorial on how to transfer epub to iBooks on iPhone can also be applied to transfer PDF to iPad, iPhone for reading with Adobe Reader, Readmill and more. 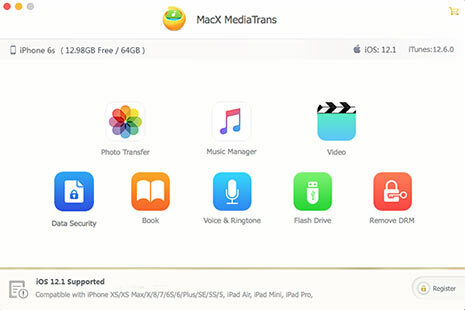 MacX MediaTrans is a professional iOS transfer tool to sync epub, pdf ebooks to iPhone XS/X/8, iPhone 7/7 Plus, iPhone 6S/6/SE/5, iPad in 3 steps. Download the iPhone Books Transfer -> Add EPUB to the program -> Sync EPUB to iPhone. That's it! How to Transfer EPUB to iPhone without iTunes? Add epub files to iPhone, and import pdf documents, transfer audiobooks to iPhone, iPad, iPod Touch etc. Remove DRM from iTunes m4p audiobooks, and convert M4P to DRM free MP3. 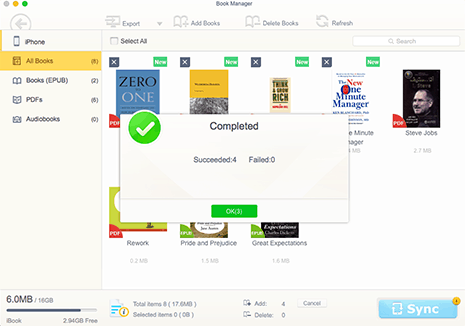 Batch transfer epub or pdf to iPhone with no file size limits which happens on e-books transferring with iCloud Drive, Dropbox and email. Transfer music, video, movies, photos, podcast, and many other media files between iPhone iPad iPod and computer, manage media files, remove DRM, convert files format as well. Download the iPhone EPUB transfer on Mac or Windows and launch it. Connect your iPhone to computer using USB cable. The program is available on iOS 7 or higher, Mac OS 10.7 or above including the latest iOS 12 and macOS Mojave. Download MacX MediaTrans right now, and have a free trail! Tab Book icon on the main interface and click on Add Books of the Book Manager window. Then select the epub documents on your Macbook Pro/Air, iMac, be it the EPUB downloaded from online sites, purchased from Apple iBooks Store, or self-made business documents etc. 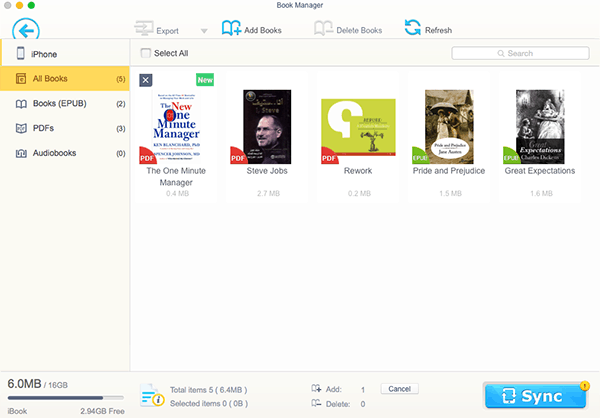 You are allowed to choose more than one epub books for batch transferring to iPhone. Click "Sync" button on the right bottom and the iTunes alternative starts to sync EPUB to iPhone XS/XR/X/8, iPhone 7/7 Plus, 6S/6S Plus/SE, or older model. When it's completed, you can open and read EPUB books with iBooks on your iPhone. EPUB files can also be sent as email attachments to iPhone, especially for small sized epub books. And it only requires a good condition internet or Wi-Fi connection. you don't need to install any third-party software indeed. 1. Open up your email client on your Mac. Address an email to yourself, and attach the epub files you want to sync to iPhone. Send yourself the attachment and then go grab your iPhone. 2. Open up the email you sent yourself just now. Tap the attachment icon to download it on your iPhone. And you will see the icon turn into an iBooks one. 3. Tap and hold on the file and an "Open in iBooks" will pop up. Click on that and you are able to enjoy your epub files on iBooks app on your iPhone freely. Another way to copy and move epub to iPhone without iTunes is through Dropbox cloud services. All you have to do is uploading the epub file to your Dropbox account and follow rest of the steps below. Remember you will need to have Dropbox app installed on your iPhone. 1. 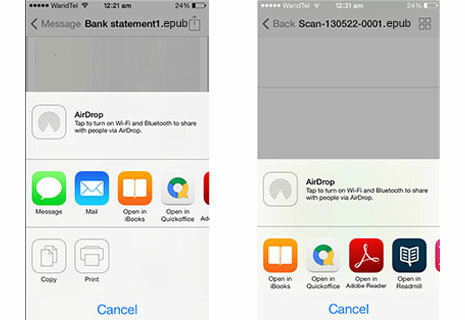 After uploading epub documents to Dropbox from Mac computer, launch Dropbox App on your iPhone and look for the file you just uploaded. 2. 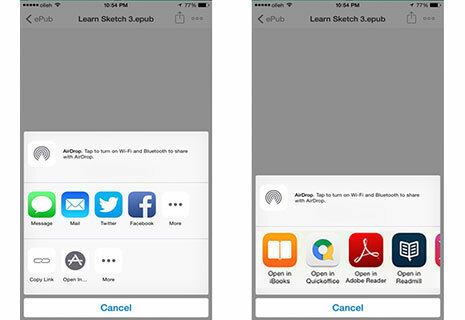 Open up the epub file and tab on the "Share" button. Next you need to tap on the "Open In..." button from the menu. This will open another menu with a bunch of sharing options. 3. Then tap on "Open in iBooks". This will redirect you to iBooks app where you will see the epub or book added in the library. Likewise, apart from Dropbox, there are some other cloud services like Google Drive, Box are also available to transfer epub to iPhone through their app on iOS devices. You can check the above steps to find out that the workaround is available through them as well. Finally, I bet these three ways about how to transfer epub to iPhone will surely help you enjoy your documents in your pocket. You can pick up the best fit one for you to import your epub documents, pdf, txt, html files to iPhone as you like. And if you any other way to sync epub to iPhone without iTunes in simple steps, please let us know in the comment sections below. Free download the solid iOS book transfer, MacX MediaTrans, to easily and quickly import EPUB documents from computer to iPhone XS/XR/X/8, iPhone 7/7 Plus, iPhone 6S/6 Plus/5S/SE in easy steps without iTunes sync. Batch transfer, no size limit.